After making a lot of changes to VB Decompiler, we are delighted to announce a new version! There are so many significant improvements in versions 10 and 10.1, that we should mention each of them. We have significantly improved the quality and clearness of decompiled code for native applications developed in Visual Basic 5.0 or 6.0. We also added support for 17 msvbvm functions in version 10, and for 48 functions in version 10.1. Thanks to that, VB Decompiler currently supports almost all msvbvm runtime functions. 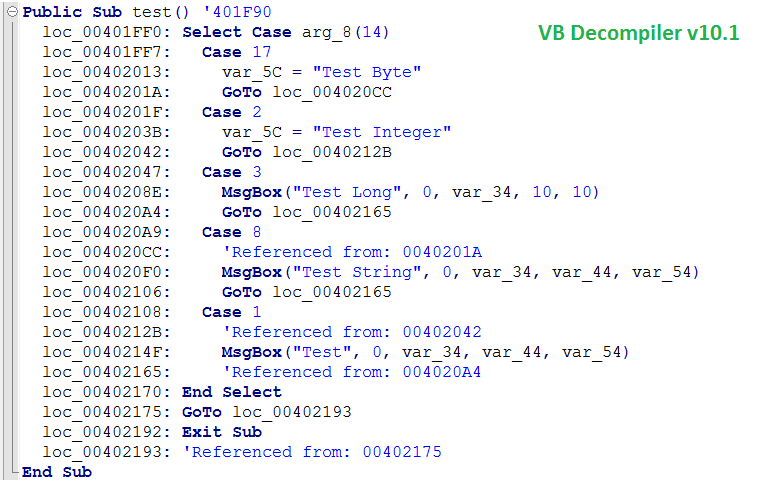 And, of course, we are going to add support for the remaining functions in future versions of VB Decompiler! We have done a lot of research and practical work on implementation of algorithms, and now VB Decompiler can decompile all common types of Select Case. 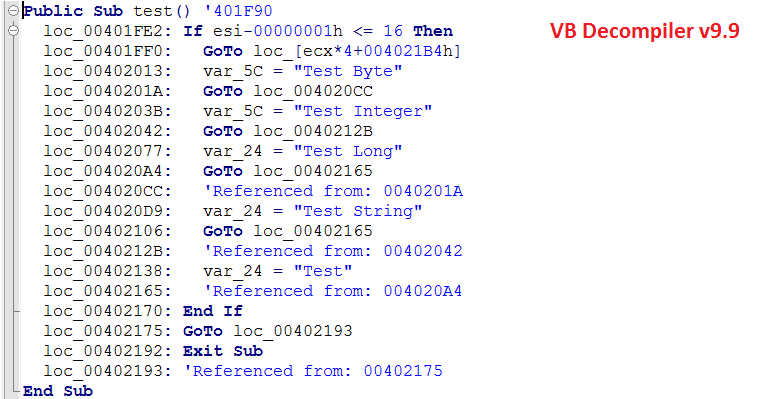 To see the difference, compare some code decompiled by the new VB Decompiler with code decompiled by an older version. VB Decompiler now supports multidimensional arrays. It can decompile not only code that creates such arrays, but also one that handles them. To achieve that, we did a lot of research and refined our emulator. Now VB Decompiler can decompile code containing calls to graphic objects on forms much faster. Compared to the older versions of VB Decompiler, the speed of decompilation of functions that handle text fields or the properties of other controls on forms has increased severalfold. The older versions of VB Decompiler remembered transitions between functions. You could get back to an earlier-viewed code by clicking the on-screen arrow buttons or by pressing the Esc key. However, the older versions of our product did not remember the cursor position. So in case of large functions, you had to manually find the lines of interest. We have fixed that problem! Besides, we fixed a number of bugs with transitions between decompiled functions. Now the emulator can detect global variables. Moreover, it can detect their use in the whole program: If a function uses a global variable, there is another function that assigns a value to that variable. It is well known that Visual Basic does not keep function addresses in .bas modules. We have developed a pretty complex algorithm to find out those addresses and pinpoint the relevant modules. Now VB Decompiler contains a significantly refined version of that algorithm, which can find even more functions in each module. We've made a lot of technological improvements, but we also wanted our product to be easier to use. In the menu of the new VB Decompiler, you can see nice icons, 32 by 32 pixels in size. We also refined the user documentation and added more languages. Just download the new version and see what we've done! We'll be most happy to see you among our clients!